I went to pick up my scans this afternoon, and guess what!? The report was in there! That means I’ve hurt my head in the past & that’s what they picked up on!! Now, who wants to see inside my head!! Yep, that’s the inside of my head! Still have some things to get checked around my allergies, but nothing serious. This is fanastic! I am so happy to hear that you don’t have a tumour (why do I think that word in Arnie’s voice? Damn you, Kindergarden Cop!). But seriously – woo. 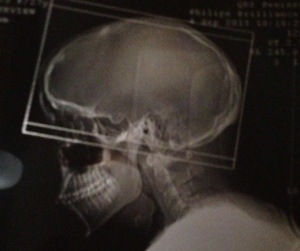 Side note: I wish I had a x-ray of my head. I almost asked the dentist for a copy of the one I got done for my teeth, it was cool. Haha I love looking at scans!